A couple of years ago, “Millennials” officially became the largest segment of the US workforce. Still young in their careers, this majority is interacting with their work environment in ways different to their seniors. As a manager in an SME, it is likely that you too interact with people often referred (though not by themselves) as millennial. This post covers how millennials broadly think about work and ways in which you can best manage this different perspective. Also note that whilst there are numerous definitions of “millennial”, for the purposes of this article we’re talking about someone aged 18-35 and, whilst the term might be jarring to some… we’ll just get on with it. If we had to summarise, the central theme to understand is that millennials work to live, rather than live to work. In the hierarchy of wants and needs that millennials consider, work falls lower in their sense of what’s important than has been the case with other generations. Whilst potentially sounding overambitious, defendants of this position are quick to clarify that it’s not necessarily an aversion to work that they have, but of work without purpose. Motivation for millennials comes from defining their work in a wider context, and not be considered as replaceable cog in the wheel. For this, they need to understand why they are being asked to do a particular task, rather to be simply told to do it. Digging into this notion more, we can set out several key dimensions by which millennials think distinctly about their work. The following comes from an excellent report on this topic by Gallup. Once the basic needs are met, it’s far more important for a millennial chase purposeful work than an extra £5k in their pay package. A sense of improvement is central to how millennials view their careers. They would much rather see company resource expended on their personal progression than flashy team outings. Millennials have a natural curiosity, even at work. What they lack is the guidance that comes from years of industry experience. Being given structure around how work should happen can channel this curiosity, rather than being dogmatically instructed on what to do. Continuing this theme, millennials want constant feedback on how they can improve, rather waiting for a year to be told what they could have done better. These regular meetings not only increase engagement, but improve performance. With an appreciation that specialised skills will become valuable in a busy workplace, millennials prefer to ensure they have useful skills for the modern way of work, rather than bring weaker areas up to mediocrity. And as we’ve noted already, they see the bigger picture around how work fits into life as whole. We’ll move now from the philosophical, to the logistical. One of the core tenets of the millennial worker is that they should be able to work from anywhere: there are blurred lines between working and living. Despite not always working from the same physical location, millennials place a high value on the social relationships that they develop at work. For most, the people whom they work with will be seen as a source of friendship outside of the workplace. 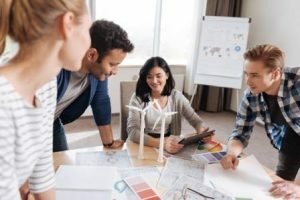 Whereas previously there may have been a strict demarcation between work and social relationships, millennials are much more disposed to cultivating out of work connections with the people whom they work with. When a millennial projects forward their view of an ideal career, there is less of a mindset around being “the company man” and instead looking at opportunities to invest in oneself, and gain skills beyond the realms of the office walls. Reid Hoffman (founder of LinkedIn) has written a book distilling this concept called The Startup of You. Despite its title suggesting a somewhat self-absorbed attitude of the modern worker, the central theme is that individuals should seek the capability to perform different functions (or at least build connections with those who do), rather than tying themselves to one employer for life. What this means for the millennial worker is that they want to progress up the ladder quicker than set schedules: they are more likely to bounce around jobs and paths to stretch themselves, rather than diligently waiting in line. The offshoot of being both curious, but also wanting to invest in themselves is that people are very open to acquiring new skills. Whilst this might be within the company’s interests, it will not have gone unnoticed that upskilling in a certain field will also benefit their own career. Unsurprisingly, a millennial is at ease with new technology, and probably knows it better than their managers. This goes deeper though. With millennials growing up with Google, there has rarely been a time when an answer can’t be sought in minutes, often to a higher degree than people present in the immediate vicinity. The millennial therefore has a default setting of “asking the internet” for answers when researching a topic, compared with other tried and tested means used previously. To read up more on the topics covered, you can also look to the following reports, which give greater insights. In wrapping up this post, we’ll bring together some practical applications of what we’ve covered. Unless you’re committed to hiring only those people who have career experience in the 20th Century then factoring in millennials to your HR plan is a necessity. For those amongst us reading and feeling resentment or even aggravation at the entitled generation entering the workforce and demanding the privileges that others before them weren’t permitted, then it is somewhat of an inevitability. The (very short) business Who Moved My Cheese offers some advice on how to think about. and most of all understand the person you’re managing likely sees the world in a way different to others around them.